Luka Bloom proves more successful at evoking moods than making incisive observations on his second album, The Acoustic Motorbike. Bloom made his album debut in 1990 with Riverside, which was a beautifully produced showcase for his lusty, brogue-inflected vocals and vigorous "electroacoustic" guitar playing. On Motorbike, Bloom reveals himself as a promising melodist as well. Songs like 'Mary Watches Everything' and 'I Believe in You' display a lovely, bittersweet lyricism, and Bloom makes effective use throughout of Celtic-flavored orchestration, drawing on fiddles, flutes and bouzoukis. His way with words is generally not as impressive as his musical intuition; at best, his lyrics summon images that are lent substance by the music and by his vibrant delivery. One of Bloom's most affecting performances on Acoustic Motorbike, however, is an impassioned reading of L.L. Cool J's 'I Need Love'. The prospect of a folky Irish rocker covering a rap ballad may seem strange, but experimenting with different forms is precisely what keeps established traditions vital. That's not to imply, of course, that the folk-rock minstrel is in danger of extinction. The times may be a-changin', but as long as people play guitars, write songs and sing - and move others by doing so - this custom will evolve and endure. Put it on, put it on, put it on for a while, put it on. With that beat - if not those precise words - Luka Bloom incites the listener to "get up on your bike, ah go on, pedal on..." Luka Bloom peppers his new recording with messages and rhythms that want to be heard. 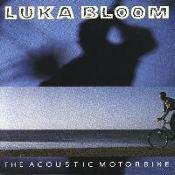 With the title track, 'The Acoustic Motorbike', Luka Bloom has written a song that not only isolates a major world problem - pollution and the daily destruction of the planet - but also offers a novel solution - cycling. The song's effectiveness lies in the obvious humor and irreverence of both the lyrics and the musical accompaniment (including didgeridoo, banjo and barnyard sqwacks and baas). It's always easier to take someone seriously when he doesn't take himself too seriously. In 'Mary Watches Everything', Mary, Ireland's everywoman, watches the changes going on in the world, and realizes that, no matter how things change globally ("everything is changing in the outside world"), life remains the same for the women of Ireland ("things are only changing in the outside world"). It's appropriate that Luka include a pseudo-emigration ballad, 'This Is Your Country', on the CD celebrating his return to Ireland. Lines like "if you close your eyes in South Boston / An Atlantic sunset fills your mind" simply capture the longing of the Irish emigrant abroad. Supporting musicians on this disc are a great mix of Ireland's best young rock musicians (Liam O Maonlaí, Fiachna O'Braonain, Peter O'Toole and Gerry Fehily of The Hot House Flowers) and Ireland's best, old and young, traditional musicians (brother Christy Moore, Gerry O'Connor, and Altan's Mairéad Ní Mhaonaigh and Frankie Kennedy), with two American musicians (Ed Tomney and Bob Riley) carried over from the Riverside album. These folks play in various arrangements throughout the CD, and then come together on the most unlikely track, Luka's cover of 'Can't Help Falling in Love'. The song that is drawing the most attention (and has, in fact, been made into a video) is L.L. Cool J's 'I Need Love'. The first time I heard the recorded version of this song, I was not impressed. I thought, "He's toned it down, it's not as lewd and rude as his live version." But I've come totally around to loving the mix of American rap with Irish traditional musicians worked in. When he tours this year and sings this song, I'll be missing Gerry O'Connor's fiddle and Christy Moore's bodhrán at the end of the song. Luka Bloom has put together a worthy successor to his well-loved 1990 Riverside release. It's obvious from the first listen that this is a totally different recording in the imagery, the style, and the mix of songs. With this recording, he has come closer to the energy and intensity of his live performances, without the distracting applause and imperfections of a true live recording. Put it on. 'The Acoustic Motorbike' is an exploration into Luka Bloom's psyche, where he has chosen the Irish countryside over the rigors of touring. Though not as powerful as his first effort, Motorbike overflows with an Irishman's soul. May this album pedal Luka Bloom into the hearts of all of us.